A native Oregonian, Cory Schreiber grew up in Dan & Louis Oyster Bar, his family’s Portland restaurant founded by Cory’s great grandfather in 1907. After working for 13 years in restaurants from San Francisco to Chicago to Boston, Cory returned home to the West Coast in 1994, to open Wildwood Restaurant. 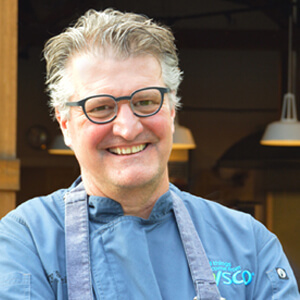 He quickly joined the ranks of leaders of the region’s bustling culinary scene, winning the James Beard Award for Best Chef Pacific Northwest in 1998. In 2000, he published his first cookbook, Wildwood: Cooking from the Source in the Pacific Northwest (Ten Speed Press). In 2007, Cory left Wildwood to apply his deep knowledge and considerable experience with local, seasonal food as the Oregon Department of Agriculture’s Farm-to-School Program Manager. During his tenure with the ODA, he wrote his second cookbook, Rustic Fruit Desserts (Ten Speed Press, 2009), which he co-authored with Julie Richardson. In January 2010, Cory joined the faculty of the Art Institute of Portland as its “culinary artist in residence,” a post he held until 2016. In February of 2016 Cory joined Sysco Foods as a chef consultant to assist with business development, product testing and culinary outsourcing.